India�s packaging industry is expected to grow 11% a year, with a turnover reaching US$21.59 billion by 2015, driven by the rising demands from the retail sector. One company that will benefit from this is Santoshi Barrier Film India, a multilayer co-extruded plastic film manufacturer established in 2003, which last year installed a seven-layer line from Indian machine supplier Mamata Extrusion Systems (MES), with a SCD die from Canada-based Brampton Engineering, to meet the demand. Food wastage is becoming a serious problem worldwide, based on various studies including that of the Food and Agriculture Organisation (FAO) estimating some 280 to 300 kg of food/person is wasted each year in Europe and the US. In Europe alone, food wastage is running at 90 million tonnes/year, and is expected to grow 40% by 2020. Amidst this threat, the European Union is enforcing counter measures to this, urging all sectors, including the packaging sector to strategise. Otherwise, it says that food wastage will go up to 126 million tonnes or up by 40% in 2020, if unabated. The figure, it says is twice the amount for developing countries including those in Southeast Asia. While convenience to dispose rather than re-use seems to be the practice in industrialised countries, the lack of technology within the producing-processing-distributing chain is causing wastage before food reaches the consumer. The organisation recommends that various technologies are now available including bag sealing to prevent wastage. This is where packaging comes into the picture. Currently ranked 11th in the global packaging industry, India�s fast paced growth will see it climb up to the fourth rung of the ladder in no time. With competition gearing up, innovation is what delineates one company from the other. Santoshi Barrier Film India says it has been combining innovation and sustainability in its film lines to produce three-layer films made of PE and PP. It also manufactures barrier packaging material for packaging of oxygen-sensitive products and incorporates a nylon/polyamide barrier for products requiring 6 to 24 months shelf life. 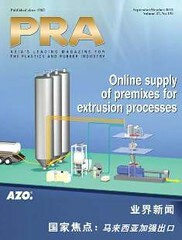 Now, it has progressed to seven-layer EVOH film made from PA/PE, which preserves the freshness of the food and is used in applications such as the Modified Atmosphere Packaging (MAP) for oxygen-sensitive products as well as those requiring storage in controlled atmospheric conditions. Dinesh Atkare, Managing Director, who is known in India�s flexible packaging industry for his processing knowledge and forward thinking, agrees that improving the films used in packaging can help reduce food wastage. �By improving the barrier properties of films (to be at par) to world class standards, it is possible to protect perishable products and reduce spoilage due to better protection and longer shelf life. Spoilage of perishable items like milk, edible oil and other dairy products is a national wastage,� he emphasised. To realise this, the company bought the seven-layer co-extrusion blown film line from Mamata Extrusion Systems (MES) last year. The entire line was supplied by MES while Canada-based Brampton Engineering supplied the seven-layer streamlined co-extrusion die (SCD) component of the line. MES was formerly known as Mamata Brampton Engineering and was a joint venture of Brampton Engineering and the Mamata Group. MES supplied this 4+1 pancake-type IBC Line with computerised controls. The line is capable of producing seven-layer films from 40-200 microns at maximum layflat width of 1,500 mm. 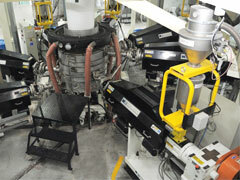 The line, which consists of four 65 mm extruders three 50 mm extruders, has an output of 375 kg/hour. �With the advanced SCD die technology, we are able to produce films that are superior (in quality) and more cost effective,� Atkare said of the MES machine. �Another big advantage is the capability of MES to upgrade this seven-layer line, in the future, to a nine-layer line with the addition of just two more modules in the die and two more extruders,� he said, adding that MES has already shown this capability when it upgraded a five-layer line to seven layers for one of its customers located near Ahmedabad. �With the installation of this new seven-layer line, we will be able to bring to the market world class film with correct barrier properties and contribute positively in reducing wastage of perishable products,� Atkare said. MES has seven barrier lines installed in India, translating to nearly 1,500 tonnes/month processing capacity � a point that favoured with Atkare�s plan for revving up his company�s productivity. �MES�s machines render excellent film thickness variation control, achieving outputs of up to 400 kg/hour and bring about an extremely competitive cost to output ratio, all of which have accorded us the competitive edge in the market,� he said. Furthermore, Atkare says the SCD die technology from Brampton Engineering has provided flexibility in terms of expensive polymers usage due to thermal isolation and individual layer thickness control. Due to the flexibility of the modules it is also possible to switch PA (nylon) usage from the middle layer to the outside. �With such asymmetric structures it is possible to replace expensive laminates for packaging of dairy products like cheese and paneer,� he explained. �The addition of this new seven-layer line to the existing facility has increased the application range covering films for packaging of UHT milk, skimmed milk powder, cheese packaging, meat and poultry; thermoformed barrier webs, lidding films, barrier films for toothpaste and many more,� he said. Atkare further believes that the potential of barrier films with specialised applications in India is huge and the company is tapping on these opportunities.